This car is still going strong at 10 years and 130,000 miles. It's big enough to schlep furniture I buy on Craigslist (I fit a queen size bed frame in there once!) But it drives like a car and easily fits into reasonably sized parking spaces. The dashboard is laid out in a way that makes sense to me (no gimmicky lights or bells and whistles), and the seats are comfortable for long drives. I think the best thing about this car is the all wheel drive. I live in Pennsylvania and sometimes we get quite a bit of snow. I have never, repeat NEVER had to shovel this car out. I just drive out of the parking lot behind my building while I watch my neighbors shovel out their cars. It's also great in the rain and on winding roads, where it hugs the road. I feel very safe driving this car, because it has excellent crash test ratings. It's easy to drive. The only negatives about this car is that the interior can be somewhat noisy, and the CD player conked out at about year 6--I've never bothered to replace it. And the gas mileage is not great (about 22 mpg average) but I figure that is the trade off for the all wheel drive. A few somewhat expensive repairs came up after 100,000 miles, but that, I think, is to be expected. I love driving through blizzards when all my other friends are stuck. I am the hero of the neighborhood when I offer rides to my friends whose cars are stuck in the snow. Subaru forest L is a great car for its all wheel drive action. This car can take on any hill or weather really well for a four cylinder engine. It holds the road good and for a smaller car has a smooth ride. The back seat could use a little more leg room but if you are alone or just two people riding it has tons of cargo space with fold down backseats and the roof rack. Also I have slept in the back with the seats folded down and had plenty of room for me and my wife. I am 5'10" 210lb. Like all Subaru for the most part you will have to do the heads at 90-100k miles but other then that and as long as you maintain them they can easily go 300k plus miles. We get about 22 mpg prob can do a little better but 22 is fine with us. One of the best things about the Subaru is they have fuzzy logic memory, meaning they remember how you drive em so the car kinda learns to suit you and your driving patterns (pretty cool huh). The is only a single cup holder in the front and it has odd placement in front of a heating vent but that is far from a deal breaker. So all in all if I had to rate this car I would have to give it a 9/10 cause nothing is perfect but these come pretty dang close. Ps its the only car I have ever drove that when I see other people in Subaru's we all smile and wave excitedly at each other. Truly a unique car community. Well me and my wife were camping when a rain storm came on and that is when we learned we can both sleep in the back with room to spare. 2014 Subaru Forester - Reliable, dependable and fun do drive. My vehicle is a 2014 Subaru forester. It's a great reliable ride that gets around without any problems. I like the fact that it's all wheel drive and very easy to control. It has its own built in system that keeps track of all the maintenance and fluids in the vehicle so it lets you know when something needs to be checked or fixed. The computer system also tells you your mpg and distance until your next refuel. It also has a great stereo system with an easy to reach auxiliary port so you can plug in a device and play music through the stereo system. The only things I dislike so far is it uses synthetic oil so oil changes cost more and if one tire goes flat you have to buy all new tires. Since the seats in the back can come down it provides great space for extra storage. This came in handy when I had about 60 boxes of laptop computers and needed to transport them to a work site. I put the seats down and was able to load them all up. After getting them all loaded up I was able to drive to the site unload and not have to make any extra trips. The all wheel drive feature is great during the winter time when the roads are snowy. It's easy to control and handle and the awd system built into the car works to make sure all the wheels are pulling correctly. It has a smart computer system that will track the maintenance and alert you when something needs to be taken care of. It keeps track of your drive time and calculates mpg and will let you know how many miles before you should refill again. It has a back up camera so you can see behind the vehicle when backing out. Also has a nice stereo system with aux plugin. The car requires synthetic oil, so oil changes cost more than the average car oil change. It is important to keep up to date on tire rotation and maintenance. AWD cars require the tires to have evenly matched treads to work properly. On top of that, if one tire goes flat all of them need to be replaced. I recently had a tire go flat and had to buy an entire new set of tires for the vehicle. Other than the above I cannot think of any other cons. Subaru introduced the fourth-generation Forester at the New York International Auto Show in March 2018. While the exterior of the 2019 model was only marginally different from that of previous models, the focus of Subaru shifted instead to quieter and smoother performance. The compact five-passenger, four-door SUV sports a more prominent grille and sharper sides but maintains the low beltline and tall windows of its predecessors. The wheelbase is longer, giving the Forester 1.4 inches more rear legroom, and the doors open to nearly 90 degrees to give passengers improved rear access. 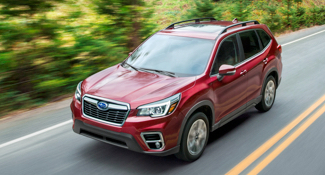 Subaru continues to offer the Forester in Base, Premium, Limited, and Touring trim levels. The Touring and Limited versions come with a voice-controlled 8-inch touchscreen infotainment system and the Touring adds new heated rear seats. 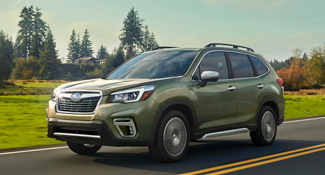 A first-ever Sport trim joins the middle of the Forester lineup and features 18-inch wheels, standard X-Mode control and Hill Descent Control, which maintains a steady speed when coasting steep declines. All but the base trim levels now sport a panoramic moonroof, which stretches from above the front seats to the rear seats. The Forester continues to use the 2.5-liter four-cylinder boxer engine of the previous generation. However, the new engine packs more horsepower (182 instead of 179) and comes with direct injection for better fuel economy. For this generation, Subaru discontinued the 250-hp, 2.0-liter turbo engines and no longer offers a manual transmission. All models now come with a continuously variable automatic transmission (CVT). As part of its campaign to increase safety, Subaru also made EyeSight Driver Assist technology (adaptive cruise control, lane-keep assist and pre-collision braking) standard on all models. The Subaru Forester was fully redesigned for the 2014 model year. This Forester grew in length over its predecessor by 1.4 inches; it's also 0.6 inches wider. Interior volume is also up; maximum cargo area increased to 74.7 cubic feet when seats were folded down. This model has more front seat travel and more rear seat legroom than previous generations. Updates to the interior design were subtle, highlighted by a simple, modern dashboard design with large buttons and knobs for stereo and climate controls. The most common model has a 170-hp, 2.5-liter, four-cylinder engine. It comes in base, Premium, Limited and Touring versions. The new 2.0XT trim offers a 250-hp, 2.0-liter turbocharged engine and is offered in Premium and Touring versions. Most Forester models came with a continuously variable transmission (CVT). On those that had the manual transmission, the number of gear was bumped to six from five. The X-Mode AWD control system, which Subaru designed for use on uneven or slippery roads, was available for some of the high-end models. New safety features introduced for this generation included optional EyeSight Driver Assist Technology, which was designed to monitor traffic movement and warn drivers if they veered off their lanes. Other safety features in later model years included an optional forward-collision prevention and forward and reverse automatic braking. The third-generation featured a major redesign that featured a less boxy exterior, characterized by a sloping roofline and softly rounded curves. With this transformation, the Forester became more of a small modern SUV than a rugged traditional wagon. The new design increased the wheelbase by 3.5 inches, and overall length, width and height by 3 inches, 1.8 inches, and 4.3 inches respectively. Second-generation models had a roomier interior and more cargo space. With the rear seats folded, cargo capacity was 69 cubic feet. The trim levels offered in this generation were 2.5X, 2.5X Premium, 2.5X Limited, 2.5XT and 2.5XT Limited. A more powerful 170-hp, 2.5-liter four-cylinder engine became standard for the X trims. The XT version engines, which were turbocharged, delivered 224 hp. Turbo versions can be identified by their prominent hood scoop that's designed to direct air through the intercooler. All-wheel drive remained standard, and buyers could still choose between five-speed manual and four-speed automatic transmission. A 2013 mini-refresh made USB and Bluetooth audio input standard features in all models. Standard safety features that were standard for this generation included stability control, brake assist, and full side-curtain airbags. The second-generation Subaru Forester went on sale for the 2003 model year. It featured an updated design with a larger, boxy body, an enlarged chromed grille, new contoured bumpers above and redesigned halogen headlamps. The Forester also had flared fenders and an aluminum hood to shed weight. This generation remained 175 inches long, but cargo space increased to as much as 64 cubic feet when the rear seats were folded. The base trim of the previous generation was renamed X and the luxury S model was renamed XS. Both models featured a 165-hp, 2.5-liter four-cylinder engines. Subaru released the XT trim with a turbocharged 210-hp, 2.5-liter engine in 2004. It launched variants of these models in later years, including the XS Premium model and the XS L.L. Bean edition, which featured leather seats and a sunroof. Air conditioning and remote keyless entry became standard on all models. Subaru updated the Forester slightly for the 2006 model year, boosting the output of the base engine to 173 hp and that of the turbo engine to 224 hp. Buyers could still choose between a manual or automatic transmission, and all-wheel drive became standard. These later models also had updated headlights, taillights, grille, front bumper and hood. Subaru unveiled the Forester at the 1995 Tokyo Motor Show. The first-generation models, which went on sale in the US in 1997, were crossover SUVs with a front-engine, four-wheel drive layout. They used the Impreza platform but carried a larger 165-hp, 2.5-liter, four-cylinder engines of the Subaru Outback. Although the first Foresters used a car-based body, they had the rugged, boxy look that would be the distinguishing characteristic of the next few generations. They were not designed as conventional SUVs, so they were close enough to the ground for easy access. Early buyers of the Forester could choose between a four-speed automatic or a five-speed manual transmission. Trim levels started with the base L, which came with air conditioning, cruise control, and other standard features. The fully-equipped S version added keyless entry, heated front seats, and 6.5-inch alloy wheels. The front bucket seats for both trims were upholstered in light cloth. The rear seats folded forward to create a flat load floor and cargo capacity in the rear was 14.4 cubic feet.